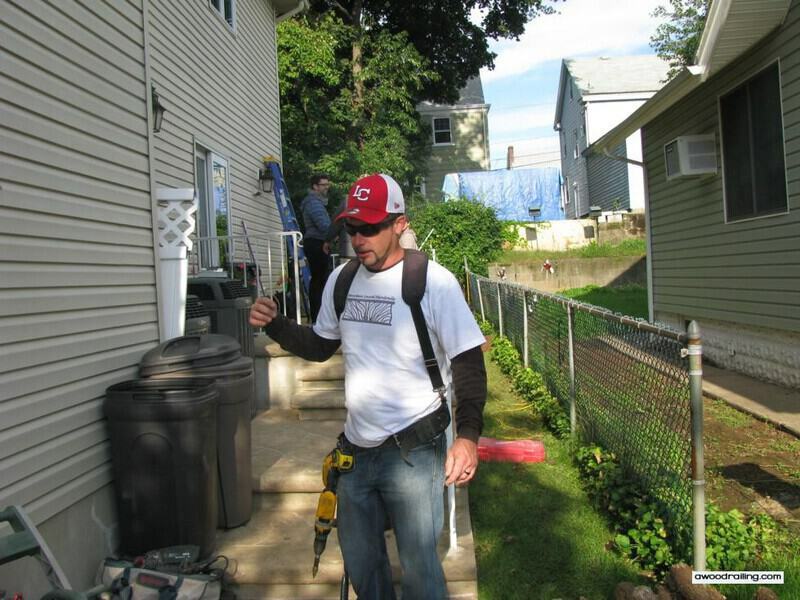 So, we had a great day at the jobsite in New Jersey installing handrails for an exterior Man Cave. 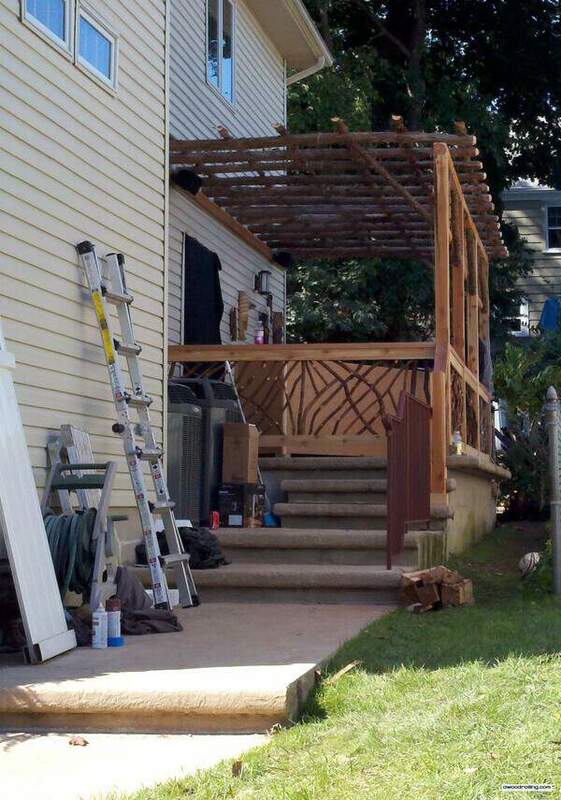 We started off the day removing a white metal porch railing, making some room for the pergola. It’s built with aromatic cedar which smells really nice when you cut it and has a nice red color. 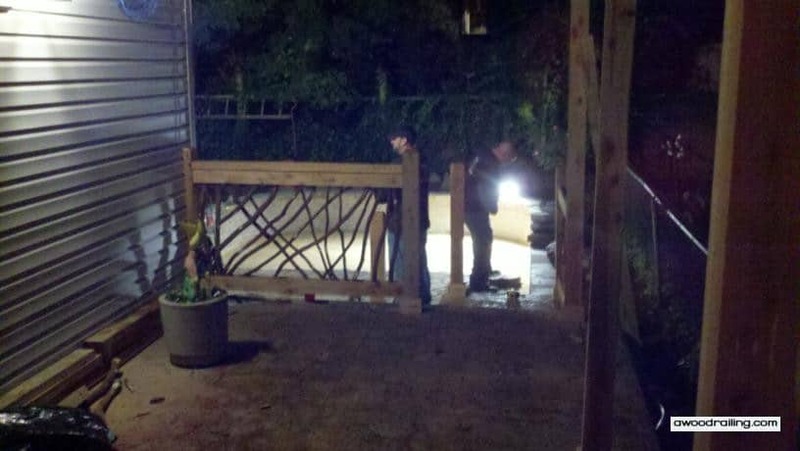 Some rustic porch railings were installed today and the rest are going in tomorrow. Man Caves has a great crew of people working really hard to get each project started and completed in a few short days. They also have an awesome tool trailer. They have a mobile setup that they roll out to set up shop on location. The homeowners are wonderful and I can’t wait to see their reactions when the project is unveiled. They man of the house is getting an exterior space with an African theme and lots of rustic details. The landscaping and masonry crew was hard at work late into the night on a new courtyard made with flagstone pavers and a retaining wall with a nice curve. Hopefully, you got to see the episode of Man Caves featuring Mountain Laurel Handrails. It was great to see it all come together in 24 minutes! In reality, there was so much work that went into that project to make it all appear so seamless. Like any other construction project there were some stumbles along the way but all in all the Man Caves crew and the production team, along with all of the independent contractors, like yours truly, came together to take this exterior Man Cave to the next level. A big thanks to the show’s designer for finding Mountain Laurel Handrails and inviting us to be a part!!! We’re looking forward to the next one. The finished Man Cave is an exterior porch and pergola with a nice grill in a custom built in end cabinet. The pergola is made of cedar logs and lumber and goes nicely with Mountain Laurel Handrail. African-themed masks adorn the walls on the house. The space continues around the corner and down two stairs into the backyard. There’s ample outdoor seating and an awesome outdoor fireplace. The homeowner’s also have a new outdoor bar to entertain their friends. Many thanks to the kind homeowners for the awesome food and iced coffee drinks! The best part about being on Man Caves was the TOOLS! Arrive at the job site prepared with four tents that are put together to create a dry and cozy work area. Roll out tools from the neatly organized tool trailer and get the whole thing set up in short order. Set up big tools like table saws and chop saws along with work stations for multiple projects going on at one time. Dedicate an area to only fasteners of which every type is accounted for and kept nicely stocked. Plenty of work surfaces and clamps also. Where is Tim the Toolman? He would have had a blast in this shop. The first thing we did after we rolled out our tools was to take off the existing railing. 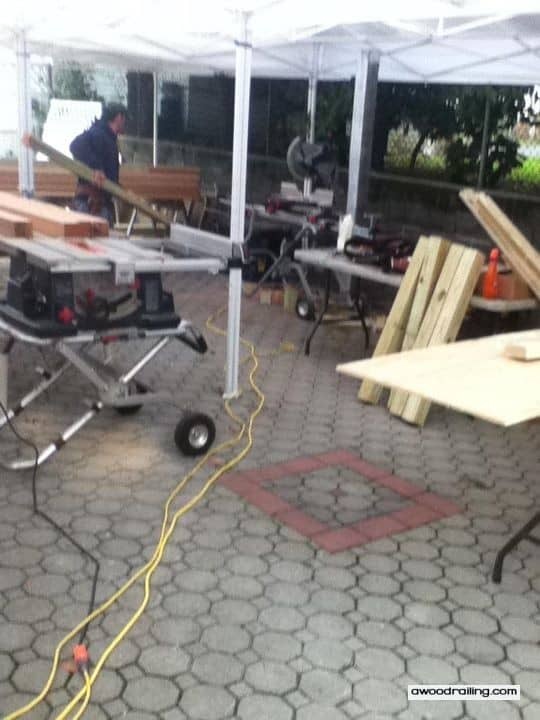 Then the pergola crew set up his posts and beams. Meanwhile, the Man Caves crew was working in the shop on custom furniture like the grill cabinet, bar and outdoor table. The crew that installed the retaining wall and paver patio did a great job and were highly skilled and capable. They ended up setting up work lights and working into the night. It wasn’t easy but I’m glad they did since it made for a real cool picture of Mountain Laurel Handrail at night! This all started with a search for ‘rustic railings’. Once the designer saw how well Mountain Laurel Handrails would work with the space, there was no turning back and they were already in the drawings! If you’d like to use this stunning railing system on your dream project, Contact me Today!